process of a ring you’ll wear forever is hard to pass up, but a custom engagement ring is daunting if you don’t know where to start. We decided to go to the true experts on custom engagement rings – the designers themselves. From advice on what to bring to your first designer meeting to an explanation of the fabrication process, let them be your guides through the custom engagement ring process. You’ve decided on a custom engagement ring, but where to start? The first step is finding the right designer. 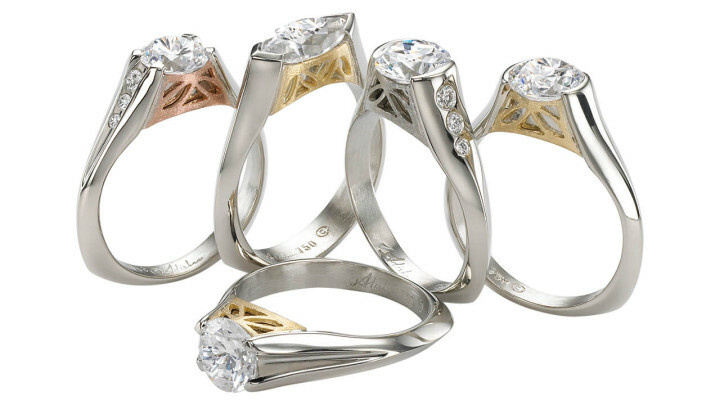 Most designers base custom engagement ring designs off of designs already in their collection. This makes finding a designer whose work aligns with your personal taste critical. Los Angeles-based designer Claudia Endler noted that her modern, minimal designs often attracts architects, graphic designers and creatives while Cathy Carmendy’s lavish vintage and Victorian-inspired designs are loved by women who like their elegance with a fanciful twist. Carmendy emphasizes the importance of finding a designer whose style matches your ideas, saying “you wouldn’t go to a modern designer to make you a Victorian style ring.” If you’re hoping to surprise your girlfriend, start by taking a peek into her jewelry box. Are her baubles simple and subtle or bright and ornate? This will give you more insight into what designs she’ll be attracted to when it comes time to pop the question. In addition to finding ring designs you love, choose a designer who you feel comfortable communicating with since creating a custom engagement ring is a very long and personal process. Designer and metalsmith Diana Widman, who specializes in only custom jewelry, begins every custom engagement ring process with an extensive interview that not only helps her determine what her client wants, but also lets them get to know one another. A custom engagement ring can take months to design and perfect, so you should be just as excited to see your designer as you are to see your ring. Luckily, more and more designers are open to custom jewelry commissions. Custom engagement rings are often heralded as the next trend, but Endler believes that it’s simply a natural progression. The options for engagement rings have increased dramatically and couples are more comfortable seeking out unique and non-traditional pieces or collaborating on an engagement ring. Widman agrees, though find that her clients are more interested in the individualized aspect of a custom piece than avant-garde design. 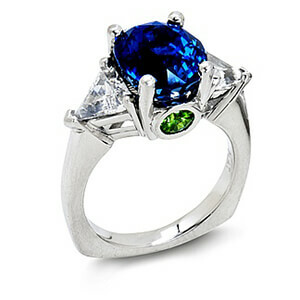 She notes that about 20% of her clients are interested in incorporating colored stones into their engagement rings, but for the most part clients request traditional styles and stones that they trust won’t go out of style. So if you’re a traditionalist, why choose a custom engagement ring at all? 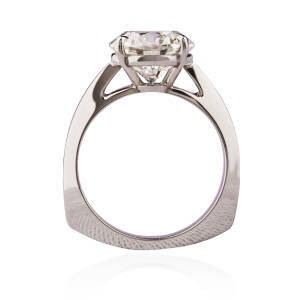 Endler believes it comes down to wanting an engagement ring that really speaks to who you are as a person and a couple. Unlike picking a ring out at a jewelry store, a custom piece involves collaboration and the designer truly gets to know your story. However, wider options for non-traditional design aren’t the biggest reason to go custom. Both Jamieson and Widman said that most couples who approach them for custom work still prefer traditional styles. The true appeal of a custom engagement ring is the process. An engagement ring is a symbol of your love and commitment, and what better way to remind one another of that bond that with a ring that you both contributed to? 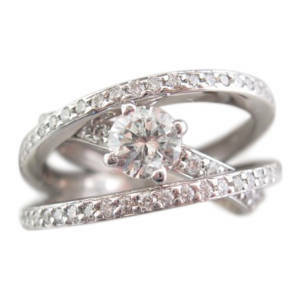 Carmendy believes that there are many beautiful jewelry options, but a custom engagement ring adds something special because you and your fiance become so engaged in the creation process. It’s a sentimental purchase and a very personal investment, she says, likening a custom engagement ring to a tattoo. Halebian adds that what makes a custom engagement ring different is that you get to know the process and the person behind the ring. It’s like buying a handmade piece of art directly from the artist instead of a mass-produced, machine-made print. 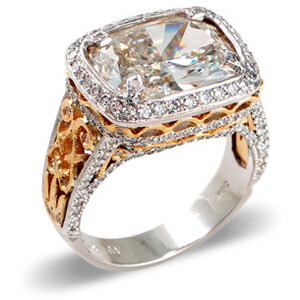 But keep in mind that a custom engagement ring, while an exciting and personal process, is also a lengthy one. You are opening yourself up to a process that, unless you happen to be a jeweler, you probably don’t know anything about, and the designer might be venturing into new and unfamiliar areas of design. Because an engagement ring is such a significant piece of jewelry, you’re going to be a perfectionist no matter how easygoing your regular approach to jewelry is. There is no one best practice when it comes to custom engagement rings, but each designer we spoke to had a definite process. Halebian said he meets each couple with a simple, “what are your likes and dislikes?” and emphasizes flexibility in the creative process. Widman begins with an in-depth interview that covers practical needs as well as design preference. 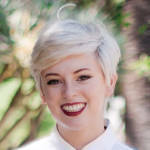 She focuses on educating clients about the physical construction of jewelry and functional requirements that go hand-in-hand with any design ideas. Jamieson begins by asking for inspiration and price point to determine not only what the client wants, but also what she can afford. Once the designer has an idea of what you want, you can begin the design process. The first step is the stone. 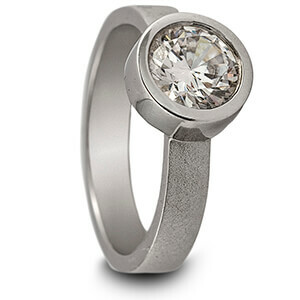 If you already have a diamond or gemstone that you want incorporated into your ring, that’s a great place to start. Designers are also able to procure stones, which is a good way to find a stone that you love if you’re completely unfamiliar with gemstones, but procuring a stone often takes longer and can extend the entire process. From there, you’ll work together with the designer to create a few options that work with your choice of stone, practical needs and personal style. The designer then takes those quick sketches and ideas and turns them into a computer aided design so you can get a fully fledged, three dimensional view of your design. Occasionally the designer will also create a wax mold of your design, but computer aided design is a staple. Once the design is fully articulated, you give your input and continue tweaking the design until you’re completely satisfied. Then the ring is manufactured and you finally get to see the product of all your hard work. When it comes to advice about the custom engagement ring process, Widman emphasizes knowing your own sense of style and explaining in detail exactly what you want. In her words, “the more you know about what you like, the better.” She suggests focusing on how to best communicate your personal style and practical needs and avoiding obsessing about specific details. Being open to suggestion and collaboration is crucial to the process. While bridal magazines and wedding blogs are great for inspiration, Jamieson is clear that the best way to research for your custom engagement ring is to go to stores and actually try on styles. What you love in a picture you may hate seeing on your finger. Focus on style and personal preference over more technical attributes like color, clarity and price, since your designer will have plenty of expertise to share in that area. And for grooms-to-be who want to surprise their girlfriends, don’t forget to find out her ring size! 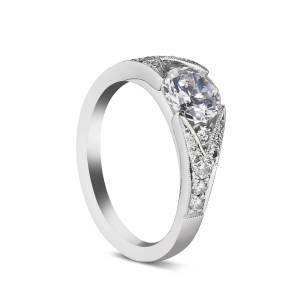 Ultimately, knowing exactly what you like is invaluable when approaching the custom engagement ring process. The biggest piece of advice? Keep an open mind. As Halebian said, “if you give some freedom to your designer, you’ll never be disappointed.” Carmendy adds, “it’s important to trust the designer.” While a custom engagement ring is all about collaboration, your designer is an expert and a valuable asset. Ask questions, give input, but don’t forget to be flexible. Unless both parties embrace the custom work, someone will end up dissatisfied.